Be the first to share your favorite memory, photo or story of Diane Rose. This memorial page is dedicated for family, friends and future generations to celebrate the life of their loved one. 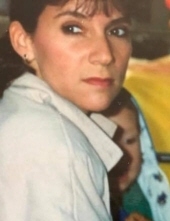 Diane Rose (Santos) Amoroso, age 62, of Stratford, CT beloved wife of Joseph Amoroso Jr. passed away peacefully Tuesday, March 19, 2019 in Bridgeport Hospital. Mrs. Amoroso was born August 19, 1956 in Bridgeport daughter of the late Americo and Lucy (Ehrenkaufer) Santos and had been a life time area resident. Diane worked all her life and retired from Liggetts Drugs. When she wasn’t working or participating in school events for her children she was making family dinner for her husband and children to come home to. She was the glue that held her family together. She was the strongest person her family has ever seen. She got her family through the hardest times in all their lives and always pulled through for them. Always full of life no matter the hardships she went through. Diane was the person who made a lasting impression on everyone she met. In her last days crosswords and puzzles brought her joy. Even the simplest of things made her happy. She put all her heart into her husband and raising her three children. Throughout everything in her life she was the one who stayed positive and looked on the brighter side of things. May she finally rest and her memory and spirit will live on through her husband and children. She will never be forgotten. Survivors in addition to her husband Joseph Amoroso Jr. include her three children, Joshua Amoroso, Jessye Amoroso and Jenna Amoroso; two brothers, Ken Ehrenkaufer and Joe Santos; several nieces, nephews and cousins and her pets whom she loved Rory, Frye, Bunny, and Chubby. VFW Post 7788, 422 Naugatuck Ave, Milford, CT 06460. To send flowers or a remembrance gift to the family of Diane Rose (Santos) Amoroso, please visit our Tribute Store. "Email Address" would like to share the life celebration of Diane Rose (Santos) Amoroso. Click on the "link" to go to share a favorite memory or leave a condolence message for the family.